As many of my regular readers will know, I am very into muted colors, nothing too bright. I have two "neon" sweaters in my closet; this one and a green v-neck. Sometimes I just want to blind people with color! On this day I decided to tone it down a bit by pairing it with a grey vest. The grey definitely tones it down but you look seriously in bright colours! This bright red is so pretty on you! I love that vest too! The red is dazzling on you and I love the vest! So colorful ! Love it ! You look beautiful in red! I love this cute and cozy outfit! Hey beauty, your outfit is perfect! I love your shoes!! Your coat is absolutely amazing, love it! Great look!! drab colored coats! And the shoes are perfect with it! Great outfit, I love the colour of your coat! Color looks fantastic on you, especially with your hair color! I love how you styled it too. Red looks so good on you!! It's funny, when I saw this picture I thought you had a very Connecticut sense of style and then I saw you were actually from there. Preppy! Cute look. Stay warm! 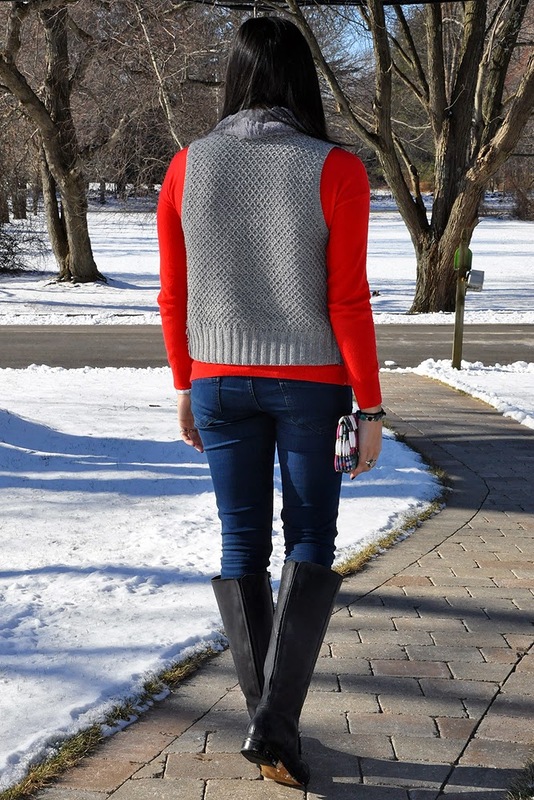 The winter could use something a bit bright, and I love it layered with the super cozy vest! You look stunning with this look. And that clutch is so pretty. cool look! love the vest!